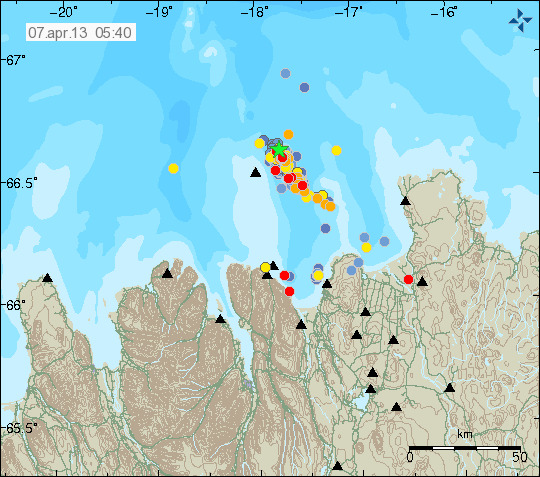 The powerful earthquake swarm that started a week ago continues, but at reduced intensity compared to 2 April when the large magnitude 5.4 quake struck. Each day, hundreds of earthquakes have been occurring (more than 200 > magnitude 2 during the past 2 days). The TFZ (as most transform zones) are not particularly prone to volcanic activity, although from time to time, (usually smaller amounts of) magma still can reach the surface in such areas as well. This happens much less so than in the rift zones, where most volcanic activity takes place. For the case of the TFZ, there has probably been an eruption in 1868 following an earthquake swarm, and little else is known about this event. Whether the current activity is related to magmatic activity, or could lead to a submarine eruption in the TFZ is unknown, but unlikely. So far there are no signs that suggest that there IS an eruption going on at the sea floor.